Bronchiectasis is destruction and widening of the large airways. If the condition is present at birth, it is called congenital bronchiectasis. If it develops later in life, it is called acquired bronchiectasis. Bronchiectasis is often caused by recurrent inflammation or infection of the airways. It most often begins in childhood as a complication from infection or inhaling a foreign object. Cystic fibrosis causes about half of all bronchiectasis in the United States. Recurrent, severe lung infections (pneumonia, tuberculosis, fungal infections), abnormal lung defenses, and obstruction of the airways by a foreign body or tumor are some of the risk factors. Symptoms often develop gradually, and may occur months or years after the event that causes the bronchiectasis. 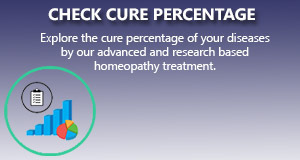 Homeopathy relieves the cough symptoms. it relieves the breathing problem and fatigue condition. Increase of weight occurs in many patient after our treatment. In our Multicare homeopathy online treatment center peoples suffering from bronchiectasis have been benefitted using our advanced homeopathic treatment packages. We apply the most scientific and research based homeopathy treatment package for bronchiectasis that gives a long standing improvement to the ailment. I have bronchiectasis since 2016. I getting many medicine but can not control. My HRCT -Scan Report ( ? Subtle bronchiectasis in middle lobe of right lung. pl advice for permanent cure from bronchiectasis.